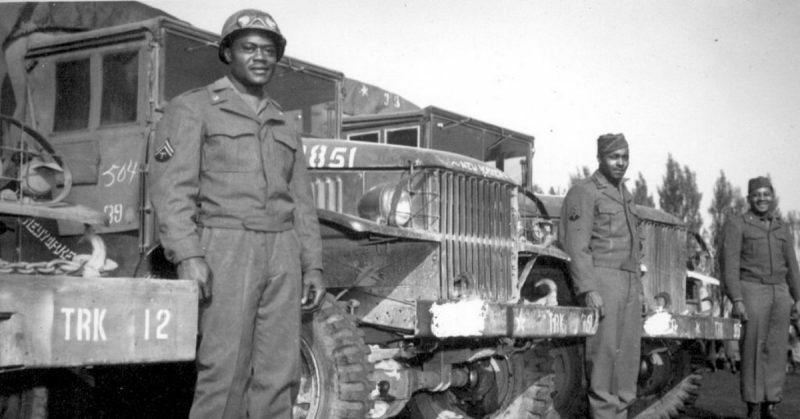 Drivers of the 666th Quartermaster Truck Company, 82nd Airborne Division, who chalked up 20,000 miles each without an accident, since arriving in the European Theater of Operations. Over 40,000 truck tires were worn out and trucks constantly tipped over due to supplies being overloaded and stacked much too high. The Germans were reeling, and the Allies were chomping at the bit to deliver them the final blow. Since D-Day on June 6, 1944, Allied forces were locked in a stagnant battle against the Germans. However, in late July the German lines ruptured and they began to retreat rapidly. The Allies were not simply marching from the beachheads of Normandy into occupied France – they were sprinting. The American General George S. Patton’s Third Army was particularly aggressive, astonishing the Germans who had invented blitzkrieg. Patton was given permission to wheel some of his forces toward Paris in order to trap pockets of retreating Germans. The chase was on, but by late August 1944 the Allies were facing a logistical nightmare. 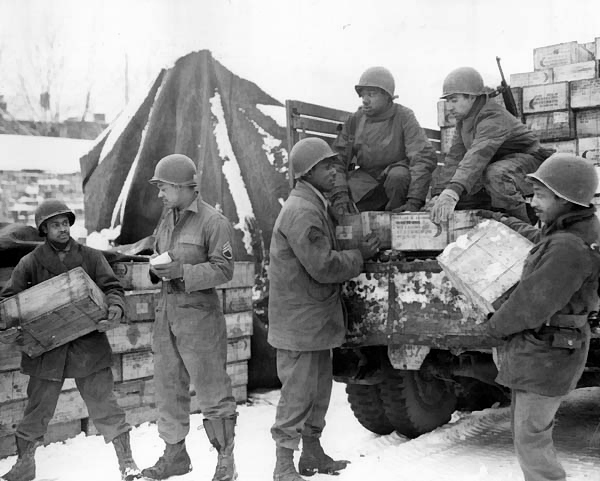 According to the memoirs of General Omar Bradley, each army division required up to 750 tons of supplies a day, and there were 28 divisions marching across France and Belgium. In a single day, Patton’s Third Army used up 800,000 gallons of gasoline alone. 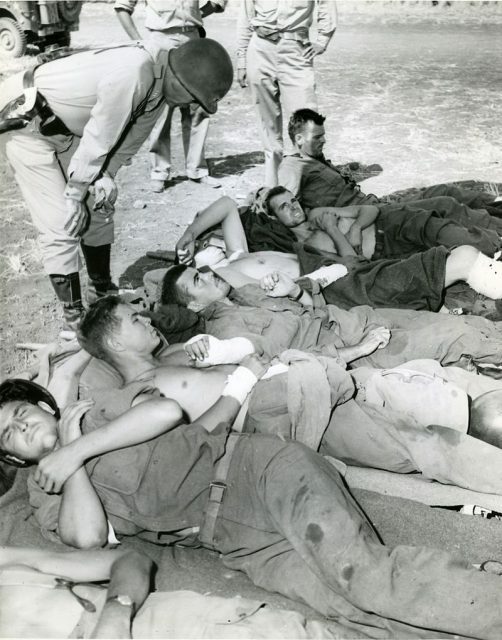 Wounded on Way to Hospital General Patton with Pvt. Frank A. Reed, East Dephon Mass, 7th Infantry 3rd Division suffering from shrapnel wound. Casualties are waiting to be evacuated by air. Working railways were mostly non-existent – ironically bombed to pieces by the Allies prior to D-Day – and the Germans still held the major cargo ports of Le Havre and Antwerp. Getting fuel, food, and munitions to the front line was proving to be almost impossible. Patton stopped his advance not because he was stymied by the Germans, but for lack of gas. Allied leaders conferred and developed the Red Ball Express, sometimes referred to as the Red Ball Line, which operated from August 25, 1944 until November 16, 1944. The name comes from an earlier logistical express used by the British. 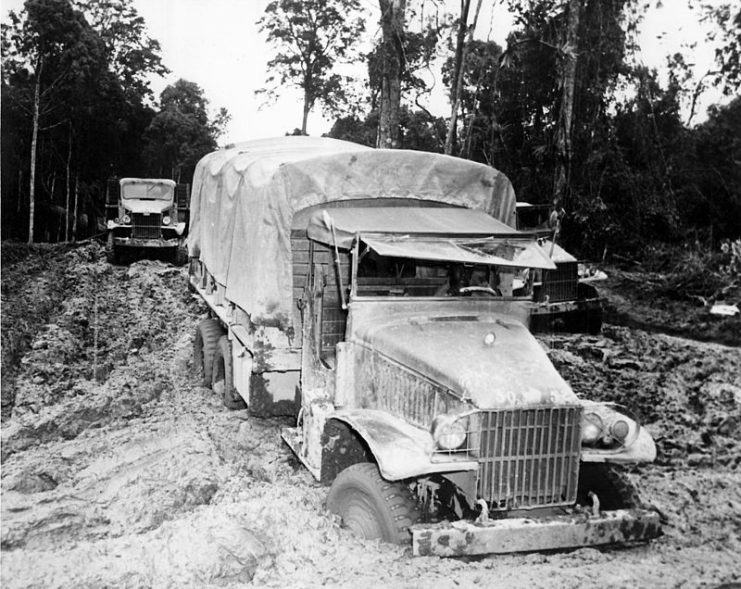 Theoretically, trucks ran in convoys of no fewer than five, racing to the front to deliver materiel. 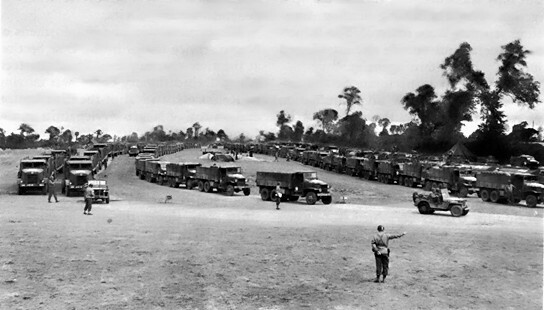 Each truck was numbered for its position in the convoy and they were to stay sixty feet apart. It was a well thought out plan. However, at once the Red Ball Express bogged down in civilian and military traffic. In response, the Army commandeered two parallel highways that traveled from the Normandy beachhead to Chartres, France outside of Paris. 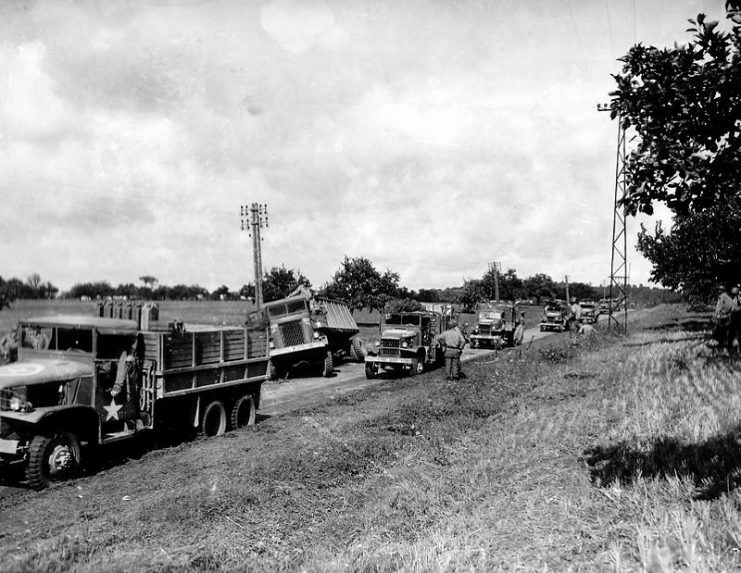 The northern highway carried trucks filled with supplies and the southern route was filled with empty trucks returning to Normandy. The route was later extended as the Allies advanced on Paris. Once the route was established, the Red Ball went into full swing. On August 29 it reached its highest tonnage day with nearly 6,000 vehicles carrying over 12,000 tons of supplies to the fight. One of the notable features of the Red Ball Express was that it was a central contribution of African Americans to the war effort. Most of the personnel who manned the Red Ball (about 75%) were black. This was due to the racial segregation of the U.S. Army at that time and the typical assignment of black troops to support and service assignments in the Quartermaster Corps rather than as front line troops. And support the men of the Red Ball Express gave, in an admirable and often overzealous fashion. There was a shortage of trucks and drivers. Therefore, the Army seized trucks anywhere it could. Drivers for the Red Ball were not selected for their driving acumen, but for their availability. Soldiers who knew about as much about driving a truck as to how to build an atomic bomb were chosen, perhaps given a cursory training, “qualified,” and told to get driving and keep driving. 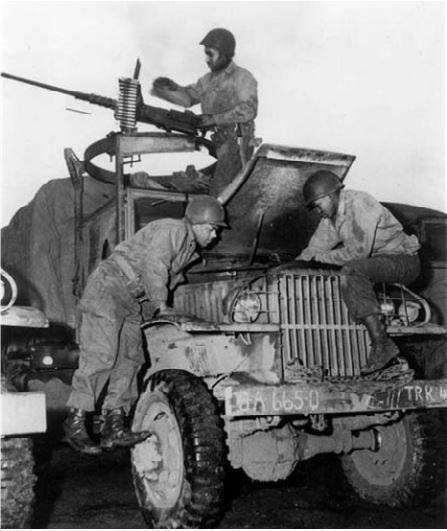 Members of the Red Ball Express repair a 2-1/2 ton truck, while a crewman at a machine gun keeps watch. The established rules of the road were routinely ignored. Even though drivers were supposed to go at 35 miles per hour, many removed the governors from the trucks that limited their speed to 56 miles per hour. It was not uncommon for Red Ball Express trucks to be careening along the roads at up to 70 miles per hour. Sleep deprivation was a major woe that usually didn’t stop the drivers as much as stripped gears, constant breakdowns, compromised roadways from overuse, and mud. The road was littered with C-ration cans, shrapnel, barbed wire, and all other sorts of war debris. Over 40,000 truck tires were worn out. Trucks tipped over due to supplies being overloaded and stacked much too high. There was also sabotage. German POWs, who were at times used to assist by checking tire pressure, cleaning windshields, and checking oil levels, were caught deliberately putting water in gas cans. When a truck broke down (not if), the driver would get the vehicle out of the way and he would hop aboard another truck until he was recycled back to the Normandy beachhead. Food, cigarettes, and other rations were shipped on the Red Ball Express. 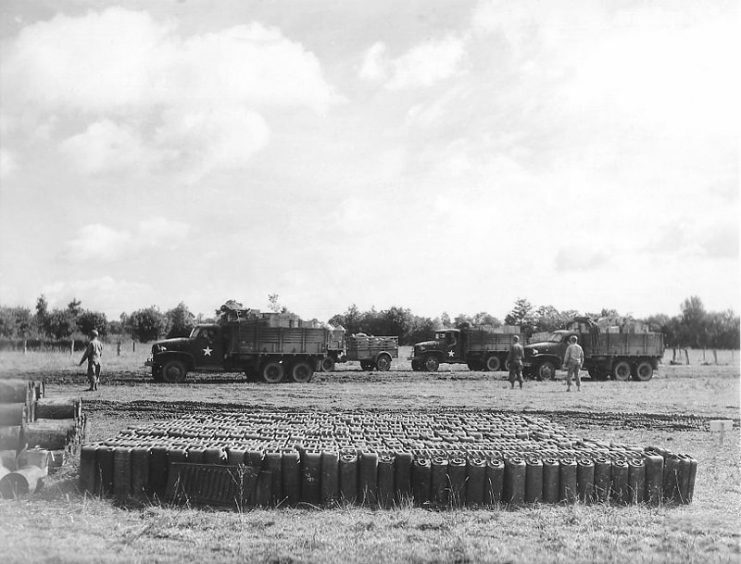 But the most precious commodity that Red Ball trucks carried was gasoline, often carried in five-gallon “jerrycans,” German-designed gasoline containers that were superior to Allied analogs. A few drivers were able to make their assignment on the Red Ball profitable as there was a lucrative black market in France. One jerrycan could fetch $100 on the black market. In fact prostitutes would except gas a payment for their services along with cigarettes and anything that had value on the black market. 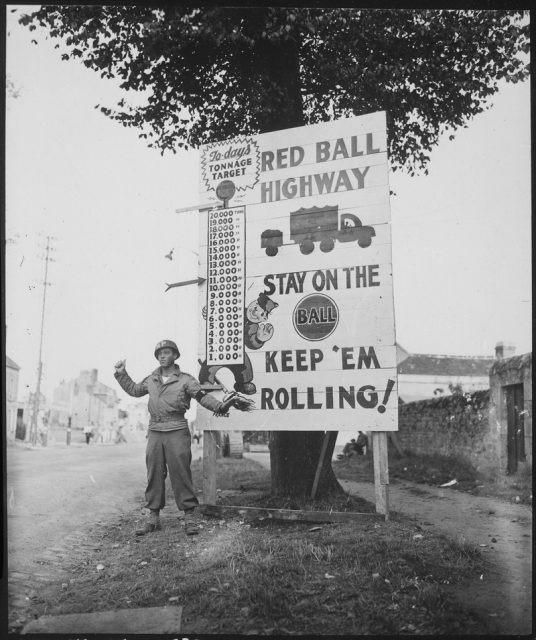 By the time the Red Ball Express was discontinued, the truckers had brought over 412,000 tons of supplies to the front thus ensuring Allied success as it pushed into Germany. Subsequent truck supply lines were also dubbed the Red Ball, but it is this original that has lived on in lore. Without the Red Ball Express, victory in Europe would have been impossible.